How Did The Irish Times Miss The Story About The Workers Party’s ‘£1 Million Iraqi Arms & Heroin Deal’? Regular readers of this blog will have noticed that my most recent posting took a bit of a swipe at Danny Morrison, who had reached for his Twittering device a tad too quickly after reading his Irish Times and in the process made a bit of a fool of himself. Danny had read a review in The Irish Times of a new book written by a UCC-based history professor, Jerome aan de Wiel called ‘East German Intelligence and Ireland, 1949-90’, in which the reviewer had taken a poke at myself for mistakenly alleging links between the East German spy outfit, the Stasi and the Provisional IRA. In a rather over-excited reaction Danny rushed on to the web to proclaim my downfall, somewhat prematurely as it turned out. Knowing I had done no such thing, I complained to the publisher only to learn that the author had made no such allegation and had in fact pointed out that I had written in ‘A Secret History of the IRA’ that in the case of the Provos’ only supposed Marxist, Brian Keenan, claims that he had an association with the Stasi were unsupported by evidence. The claim otherwise had come only from the reviewer, one Derek Scally and at my insistence The Irish Times published a correction. By way of an apology, the publisher’s most polite commissioner editor, Tony Mason sent me a copy of Prof. aan de Wiel’s book and it arrived yesterday. Last night I settled down to leaf through the index and to read passages that seemed interesting. It didn’t take me too long to wonder what it takes these days to be a book reviewer for The Irish Times. It seems that a basic qualification appears to be a complete lack of news sense or a sharp eye for the politically acceptable slur. This book by Prof. aan de Wiel has some fascinating and historically valuable stories hidden between its covers and I thoroughly recommend it to readers of this blog. But reading The Irish Times’ review, one is bound to wonder whether the reviewer ever read the whole book, whether he just did not want these stories given wider circulation for reasons I can only guess at, or whether he just wanted to engage in a bit of Ed Moloney-bashing. Because as stories go, believe me, my alleged failings are in the ha’penny place compared what Prof. aan de Wiel has managed to uncover. Here’s a story that I found on page 80 and I know that if I was a reviewer I would be highlighting this in my piece, along with another gem of a story that I will describe on another day. First a bit of background. In the 1970’s and 1980’s, right up to the collapse of the Soviet Union, the Stalinist left in Ireland was represented by the Communist Party of Ireland (CPI) on the one hand, and the Workers Party (or its various other manifestations) on the other. The two were in often vicious competition for the affections of the two biggies in the Communist world, the Communist Party of the Soviet Union (CPSU) and the Communist Party in its powerful neighbour, East Germany which was known as the SED, or Socialist Unity Party of Germany. Because the Workers Party (WP) was growing in electoral strength – it eventually mustered seven deputies in Dail Eireann – and the CPI could hardly gather more than 500 votes, the CPSU favoured the WP over the CPI. That was important because it meant the WP were invited to all the conferences in Moscow, got up there on the platform with the party luminaries and had access to all that Moscow gold (and more as we shall see another day!). The SED however seemed to still have a soft spot for the CPI and continued giving it a hearing, much to the WP’s undoubted irritation. So, as you might expect, the rivalry between the CPI and the WP could get hot and heavy. 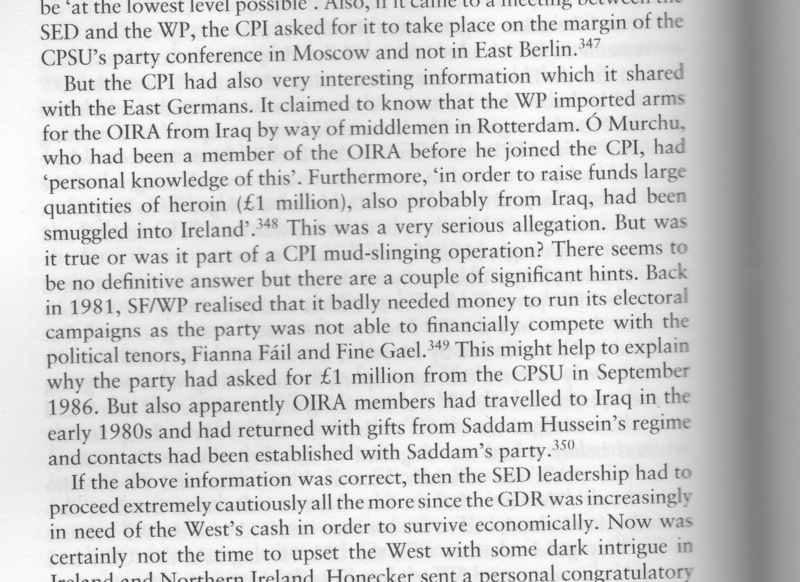 While I would not want to be on the receiving end of WP hostility (they were people not averse to trying to get Loyalists to kill you and in my case nearly did), I have to say that the following account shows that the CPI were no slouches either. Now, I have no idea whether the allegations made by the CPI are true or not. But I will say two things. One is that Prof. aan de Wiel gives them house room for compelling reasons that he explains at the end of the paragraph (the East Germans also took it all very seriously and kept some distance from the WP thereafter); the second is that, right or wrong, the story is damned sight more interesting and relevant from a reviewer’s viewpoint than any alleged blunders made by someone like myself. Anyway here is the extract from the book. These events happened in 1986, by the way. Enjoy. I know I did. So the question must be asked: why did The Irish Times not even mention this story? In 1986 the Workers Party was on the eve of its best every electoral performance while heroin addiction was at record levels in places like Dublin. Within a few years some of its leading members would join the Irish Labour party and are now in government. Did any of them know about this arrangement? Was it true? Shouldn’t The Irish Times at least be asking the question? If it is like the States, the Irish Times only publish stories that the wealthy owners want people to know.